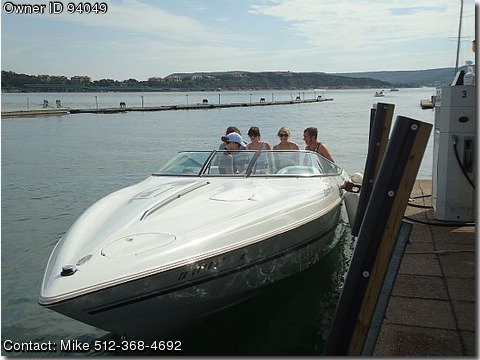 Call Boat owner Mike 512-368-4692 512-632-9982. Description: Great boat in excellent condition w/ Mercruiser 502 Motor only 250 hours. Comes with matching full cover and cabin cover , 1000W stereo MP3 and USB, Marine radio, new never used potty, new coated anchor, bilge pump, carpet, Coast Guard pack, compass, depth finder, Gaffrig gauges, Halon extinguisher, SS prop., storage, swim platform, trim tabs, dual switchable batteries, captains choice exhaust, dual axle trailer with brakes, upholstery in great condition, sleeps 2, no scuffs, will do 70mph.